Today, The Washington Free Beacon picked up an incredible soundbite of MSNBC’s Rev. Al Sharpton misspelling the late great Aretha Franklin's classic lyric, “R-E-S-P-E-C-T," as he attempted to lambaste President Donald J. Trump for saying that former White House staffer Omarosa Maginault Newman was "fired like a dog." Rev. Sharpton began by noting how often President Donald J. Trump loves to use the term “fired like a dog” or some variation of it, such as saying “Sally Yates choked like a dog” during her Senate confirmation hearing. He even highlighted how the President referred to Steve Bannon, who is often vilified as being racist by the left, with the canine description. But then, he seems to insinuate the president called Omarosa a dog out of some sort of racial animosity. Sharpton reminds his audience that President Trump stated last year he would tell any National Football League coach to “get that son of a b*tch off the field” who was kneeling for the national anthem if he was an owner. Sharpton notes the athletes kneeling out or protest were predominantly African American players. However, Sharpton believes the president might have met his match with Omarosa. 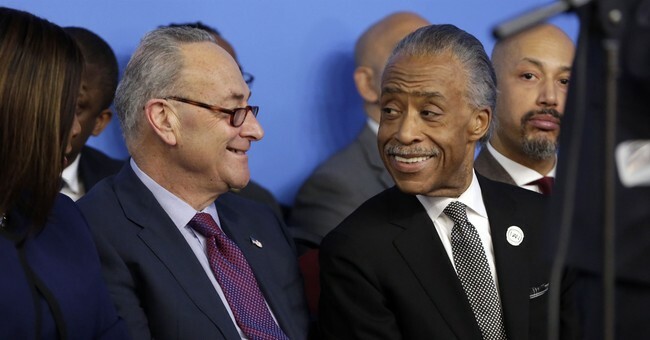 “I think you might’ve learned the lesson this week, sometimes the dog bites back with a book deal," Sharpton said. “And while we’re talking about female canines, you know what they say about say about payback, it ‘s a real, well I’m sure you know the word I’m thinking of." Some may blame this mishap on the teleprompter and a simple mistake in front of the camera. If that is the case, it should be noted this is not the first time his team has had communication issues. Readers might remember in 2011, Sharpton gave a rallying call of "Resist we much. we must. And we will much. About that be committed," to fellow progressives on the night of Wisconsin Governor Scott Walker's recall election. Teleprompter or not, the MSNBC host has never been the greatest communicator. Here he is rambling about blueberry pies, Republicans, and Brooklyn.